Here are the three major types of termites namely drywood , formosan and subterranean termites. Here are Drywood Termites busily feeding on wood. By their name, drywood termites nest above ground and do not require moisture and soil contact. These termites infest on dry wood and mostly feasting on wooden furniture and fixtures. Their swarm is significantly smaller than subterranean termites which could start with 50 workers and growing to 3000 in over 15 years. Due to the colony’s size, a considerable structural damage to properties could take years to happen however giving a blind eye to early signs of infestation could prove detrimental later on. Homeowners may conduct regular inspection to properties prone to drywood termites such as furniture and inspect for signs of termites on wooden materials brought from the outside. Formosan termites are actually the most well known subterranean termite. They work similarly and possess the same characteristics. Damages brought about by Formosan and subterranean termites are also the same. The major difference lies on how fast these termites can affect damage to wood structures. Typical subterranean termites take years before significant damages are observed while mature Formosan termite colony could wreck havoc to properties in as short a period as three months such that they are referred to as “super termites”. Also, these termites can create secondary nests called cartons which can be found above ground, usually on walls, so long as there is constant moisture. These cartons can cause walls to bulge that could ruin structural aesthetics and cause significant damage. Ground treatment is vital to Formosan termite control so homeowners are advised to eliminate wood debris and remove all woods on soil. Nests can be addressed by significantly reducing moisture level on wood by drying them out. WHAT ARE THE SUBTERRANEAN TERMITES? These termites are the most common and are very destructive. Subterranean termites colonies are huge with its swarm reaching millions. They take a long time, usually years, to create significant damage to structures because they spend time to establish and grow their colony underground, building tunnels that spread out in all directions to forage and breed. Once they have established, they begin to infest structures they can access especially if there is the presence of moisture and creating mud tunnels to conserve moisture. 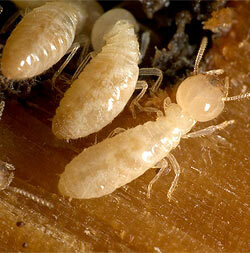 Wood and other cellulose materials are the primary diet of subterranean termites. It is characteristic to these termites the need of steady moisture source and soil contact. Red flags to subterranean termite infestations include swarming termites around lights, on door frames and windows, shedding of wings which can be found on window sills and frames and sometimes trapped in cobwebs, the appearance of mud tunnels running in both interior and exterior of the structure in vertical position, and the visible damages on wood walls, posts, etc proof that the established colony has now started to eat and destroy wood. and installing gutters to eliminate moisture problems.